The ad will first appear in the December 11 issue of Michigan Lawyers Weekly, commemorating this year’s class of “Up & Coming Lawyers,” which includes Kerr Russell’s very own William Blasses. 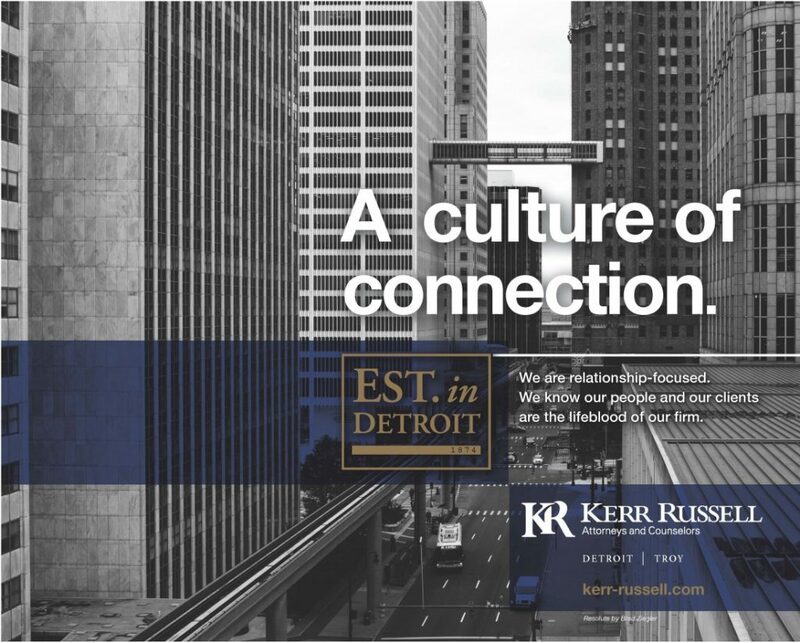 Kerr Russell’s marketing team collaborated with Identity Marketing and Public Relations on this new campaign to emphasize the firm’s longstanding place in Detroit’s history. A key feature is the stamp which reads “Est. in Detroit 1874,” an iconic affirmation of Kerr Russell’s place in the Detroit landscape. For this latest ad, local artist Brad Ziegler was tapped to provide the featured photograph: titled “Resolute,” the image is a straight shot down Larned Street, with the iconic People Mover track dissecting the photo and Kerr Russell’s home in the Ally Center (formerly One Detroit Center) on the right hand side. The ad will also be featured in the January/February issue of dbusiness.